Austin, Texas -- A delegation, including members of the Auto Body Association of Texas (ABAT), the Houston Auto Body Association (HABA), and Texas Watch, a statewide consumer group, met with high-level compliance and consumer protection staff at the Texas Department of Insurance (TDI) on Wednesday to discuss abusive insurance industry practices and how they illegally reduce coverage and threaten Texans' safety. The recent $42 million verdict by a Dallas jury to a catastrophically injured couple for damages caused by unsafe automobile repairs has refocused attention on the safety of the Texas motoring public. The delegation discussed common pressure tactics used by the insurance companies when contesting repairs that must be made to return the vehicle to a safe condition. Among the range of topics discussed, the group also raised the issue of how insurers wrongly steer Texans to body shops with whom they have a pre-existing commercial relationship. Burl Richards, President of ABAT, stated: "Reimbursing shops the same based on a 'prevailing' rate and not taking into consideration the difference in the investment of individual shop's commitment to training, equipment and certifications is out of touch with reality. You cannot continue to repair today’s technologically advanced vehicles the way you did even 3 or 5 years ago. You must research and follow the OEM recommended processes and procedures. "When the insurance company is dictating repair methodology based on 'profits,' then the consumer is put at risk. If consumer safety and proper repairs that restore vehicles as close as humanly possible back to their 'pre-loss' condition is put in front of profits, then everything else will take care of itself." John Kopriva, President of HABA, stated: "Repair industry overview reveals that too often repairs are being made based on 'profit' and not on consumer safety and restoring vehicles to their pre-loss condition. Technological advances in vehicle manufacture utilizing onboard computerized systems are a fact of life. "Many shops are far behind and don't know what they should know; training and capital investment in equipment are not keeping up. Insurers continue to push back by refusing to follow OEM procedures, P-page logic and mandating repairs by unskilled appraisers. Refusal to compensate fairly and hiding behind 'prevailing rate,' the over-use of salvage, aftermarket and reconditioned parts is out of control and drastically needs to change. "The time has come for our industry to stand up and make some tough decisions to balance insurance and shop cooperation. Consumer safety and adherence to quality repairs should be at the top of the list." Ware Wendell, Executive Director of Texas Watch, stated: "Texans have the right to choose the body shop that will repair their vehicle. They should shop around, check out repair facilities' qualifications, and make sure repairs are made using high-quality parts and proper procedures. Insurance companies care only about their bottom line. Insurance schemes designed to cut their costs can cost your family its life if an unsafe car is put back on the road." The delegation will continue to document insurance company abuses for TDI and is calling on the state regulator to mount an investigation into abusive insurance practices and to take enforcement action where indicated. HABA is comprised of collision repairers devoted to the advancement of the collision repair industry. Its mission is to create an environment of professionalism, respect, accountability, excellence, enthusiasm and the ability to collect fair and reasonable compensation for collision repairers who properly restore vehicles to their safe pre-loss condition. For more, please see www.habaonline.org. Contact John Kopriva at (713) 598-6381. ABAT seeks to give auto body shops a voice and a forum to communicate and discuss industry related issues along with the educational platform that ensures the safe and proper repair of today's high-tech vehicles. For more, please see abat.us. Contact: Burl Richards at (903) 657-8082. Texas Watch, a statewide non-profit consumer advocacy organization, has fought since 1998 to ensure insurance companies do not take advantage of policyholders and the public. 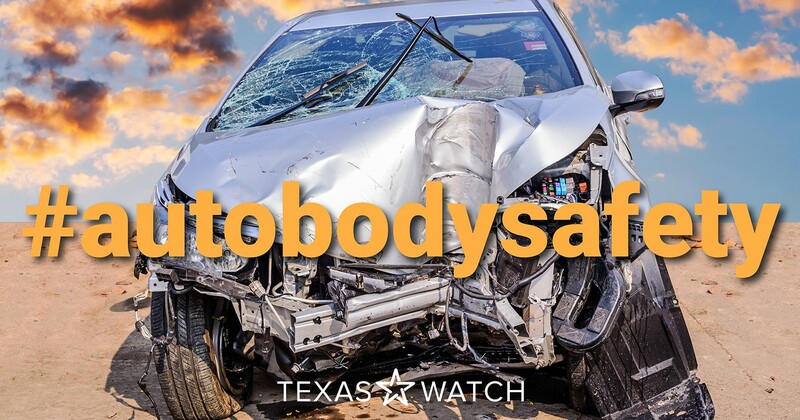 For more, please see www.texaswatch.org/auto-body-safety. Contact Ware Wendell at (512) 381-1111 or wwendell@texaswatch.org.